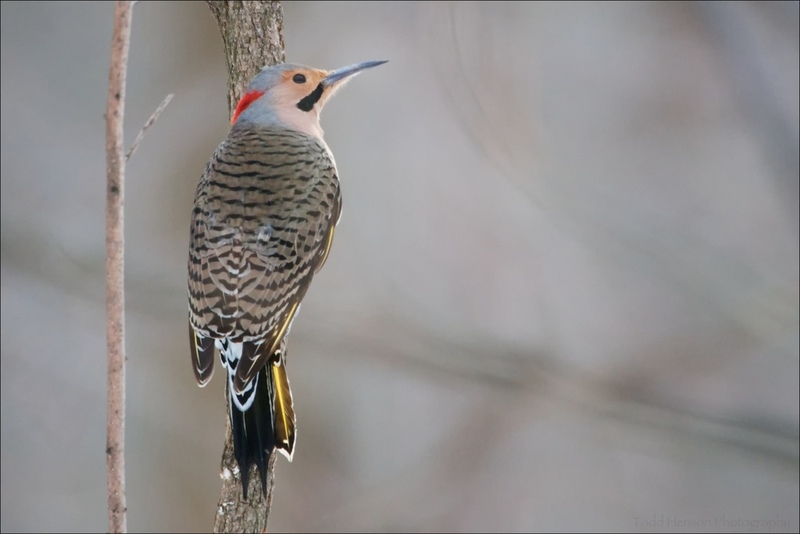 The Northern Flicker has a similar body shape to the Red-bellied Woodpecker, but is a little larger. The Flicker's back is a barred pattern of brownish gray and black. It's chest is white with black spots. 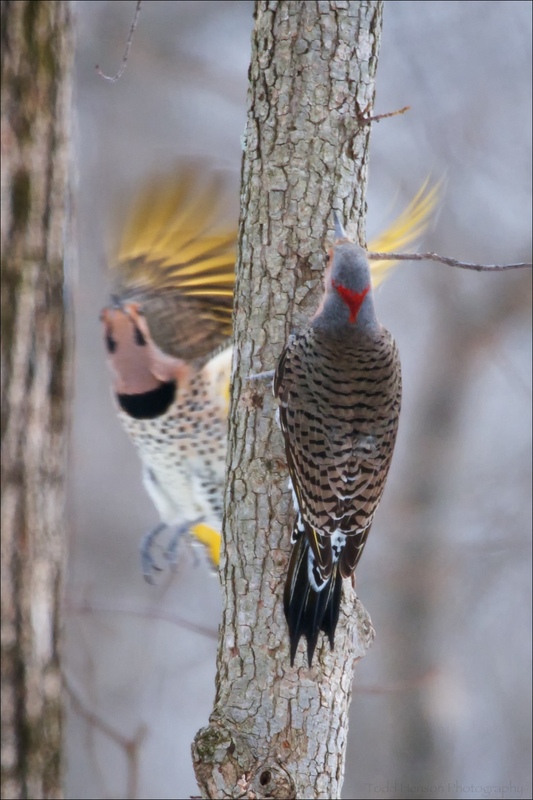 There are two variety of Northern Flicker, Red-shafted and Yellow-shafted. Red-shafted Northern Flicker are found in western North America. The underside of their wings and tail are a reddish color. The male has a red mustache and the female does not. Yellow-shafted Northern Flicker are found in northern and eastern North America. The underside of their wings and tail are yellow. They also have a red crescent on the back on their head. The male has a black mustache and the female does not. All of the photos on this page are of the Yellow-shafted variety. I have sometimes seen Northern Flicker in neighborhoods, often on the ground eating ants. while other birds eat from the bird feeder. They look interesting enough when hopping around on the ground, but they are absolutely beautiful when in flight. The bright yellow under their wings and tail really stands out. Very colorful bird. Male Northern Flicker in flight. The bird is out of focus, but notice the bright yellow color under the wings and tail. My brother and I went hiking one morning in February just after a large snowfall. One of the first sights we saw was a pair of Northern Flicker chasing each other and appearing to play with one another. We had thought it might be a courtship between a male and female, but after studying the books they both appear to be male. Notice the black mustache on both birds. I don't know if they were disputing territory, or if perhaps they were just enjoying themselves. Either way, my brother and I certainly enjoyed ourselves, watching the dueling Flickers and attempting to photograph the action. Two male Northern Flicker. The standoff escalates.